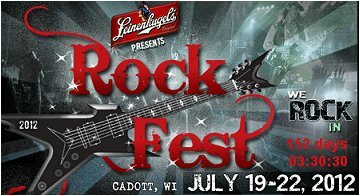 Def Leppard play at Rock Fest in Cadott, WI on 22nd July and the Sunday line up has now been finalised with Lita Ford and Sebastian Bach added to the show. Both acts will play before Def Leppard and Poison on the final night of the three day event with the already announced acts Firehouse and Cydonia completing the six band bill. At least according to the festival site (the Leader Telegram site has Warrant in place of those two bands). "Also coming to Rock Fest this year are Black Stone Cherry, Lita Ford, Sevendust and Sebastian Bach. Sevendust played on the same day at Rock Fest as Shinedown in 2009, but the other three acts are new to Rock Fest."